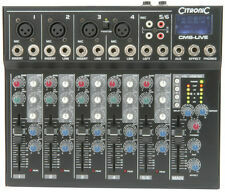 Citronic CM10-Live Compact 10-channel Mixer With Delay USB/SD Player. Rack-mount ears supplied with CM8 and CM10 models. Compact format live mixing console with mic/line inputs (jack/XLR) and a stereo line channel which can be fed from an internal USB/SD audio player. Citronic CM6 Live USB Mixer. Citronic CM6-LIVE Compact Mixer with Delay USB/SD Player. Compact format live mixing console with mic/line inputs (jack/XLR) and a stereo line channel which can be fed from an internal USB/SD audio player. Citronic CDM8:4 USB Mixer. Equaliser : Bass -30 10db@ 100Hz. Equaliser : Midrange -30 10db@ 800Hz. Equaliser : Treble -30 10db@ 9kHz. 45mm rail glide replaceable crossfader with defeat and assign channels. CDMX-1 DJ Mixer with power lead working. The PRO-2 MKII is a straightforward traditional two-channel mixer with a solid build quality and an uncluttered layout. 2 channel, 5 input mixer - 2 phono, 2 line, 1 mic. Easy glide replaceable crossfader. 45mm rail glide replaceable crossfader with defeat and assign channels. 2x phono, 6x line, 2x USB IN/OUT, 1x 3.5mm jack and 3x microphone inputs. Remote fader starts on stereo channels. Hi/Lo EQ for each mic channel. Powered mixer with balanced mic/line inputs and 2 stereo inputs, each with 3-band EQ and aux send. 24-bit 16 program DSP effects. 2 x 200w RMS @ 4ohms. Internal stereo power amplifier. Effects : 16 program DSP (24-bit sigma-delta, 40khz). All inputs and outputs are stereo via balanced XLR connectors. Stereo/mono operation for each zone. Outputs: Zone 1 to 5 L R, balanced XLR-M. Input impedance: 40kR. Output impedance: 220R. Frequency response: 20Hz-25kHz ( 0/-1dB). All the features found on the larger CSP Series models are here: The built-in effects provides 16 reverb, delay and modulation effects with individual FX sends on each channel. Individual Aux sends allow a monitor send to be created for output to an external monitoring system. A compact format live mixing console with mic/line inputs (jack/XLR) and a stereo line channel which can be fed from an internal USB/SD audio player. Phantom power of 48V is switchable to the XLR inputs for condenser microphones. Powered mixer with balanced mic/line inputs and 3 stereo inputs, each with 3-band EQ. DSP with 100 different effects, e.g. reverb, hall, echo and multi-effects. 6 mono input channels, each with PAD switch, 3-way equalizer and pan pot. Equaliser : Bass : 12dB, -26dB @ 100Hz. Equaliser : Midrange : 12dB, -26dB @ 800Hz. Equaliser : Treble : 12dB, -26dB @ 9kHz. Mic override facility for DJ mics. 2 dedicated balanced mic channels with 3-band EQ. 14 input, 4 channel DJ mixer with 3 band EQ and microphone inputs. DJ mic 2 vocal mic inputs for karaoke. 2 x phono, 6 x line, 2 x USB IN/OUT, 1 x 3.5mm jack and 3 x microphone inputs. Inputs RCA, USB, 1/4" jack. Citronic CM8 Live USB Mixer. Citronic CM8-LIVE Compact Mixer with Delay USB/SD Player. Rack-mount ears supplied with CM8 and CM10 models. Compact format live mixing console with mic/line inputs (jack/XLR) and a stereo line channel which can be fed from an internal USB/SD audio player. Equaliser : Bass : -30 10dB @ 100Hz. Equaliser : Midrange : -30 10dB @ 800Hz. Equaliser : Treble : -30 10dB @ 9kHz. DJ mic 2 vocal mic inputs for karaoke. Hi/Lo EQ for each mic channel. 45mm rail glide replaceable crossfader with defeat and assign channels. Citronic CDM10:4 (MKV) 19" 4 CHANNEL USB MIXER. Equaliser : bass 12dB, -26dB @ 100Hz. Equaliser : midrange 12dB, -26dB @ 800Hz. Equaliser : treble 12dB, -26dB @ 9kHz. 2 USB input/outputs for channels 3 and 4. Equalizer : Bass 12dB, -26dB @ 100Hz. Equalizer : Midrange 12dB, -26dB @ 800Hz. Equalizer : Treble 12dB, -26dB @ 9kHz. Back panel can be positioned on rear or underside of mixer for install. 2 USB input/outputs on channels 3 and 4. The PRO-2 MKII is a straightforward traditional 2-channel mixer with a solid build quality and an uncluttered layout. 2-channel DJ mixer. 3-bar LED monitor. Easy glide replaceable crossfader. Headphone cue mix. 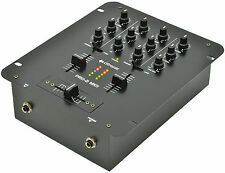 Citronic CDM8:4 USB Mixer. The Numark HF125 multi-purpose headphones employ large 40mm Mylar speaker drivers, enabling you to hear exactly what's happening with your EQ or effects. You'll never have to compromise on the way you hear your mix with these flexible 7-position independently adjustable dual ear cup headphones. A 1U live/zoning rack mixer, with 2 mic/line inputs and 2 stereo line inputs feeding 4 stereo outputs. Mic channels feed to all outputs, whereas the stereo channels are switchable to any required zone. Citronic CSP-714 Powered Mixer Amplifier. CSP SERIES COMPACT POWERED MIXERS WITH DSP. Powered mixer with balanced mic/line inputs and 2 stereo inputs, each with 3-band EQ and aux send. Internal stereo power amplifier. Rack-mount ears supplied with CM8 and CM10 models. 3-band EQ for each channel. EQ: high: 10kHz, ±15dB. EQ: mid: 700Hz, ±15dB. EQ: low: 50Hz, ±15dB. Compact format live mixing console with mic/line inputs (jack/XLR) and a stereo line channel which can be fed from an internal USB/SD audio player. Mic override facility for DJ mics. 2 USB input/outputs for channels 3 and 4. 2 Dedicated balanced mic channels with 3-band EQ. 2 Auxiliary mics on channels 1 and 2. 19" 6U Rack mountable. 4 Channel, 17 inputs. PRO:2 MKII DJ MIXER. Get up and running quickly at any gig.The PRO-2 MKII is a straightforward traditional two-channel mixer with a solid build quality and an uncluttered layout. 2 CHANNEL COMPACT DJ MIXER. CE22 Stereo Enhancer/Exciter. The CE22 is a professional multi-band enhancer/exciter designed for various applications. This unit combines 2 processors to align the phase and focus of bass frequencies, improve the response of mid-high frequencies and add harmonic content to any "dull" sounding audio. A straightforward traditional two-channel mixer with a solid build quality and an uncluttered layout. 2 channel, 5 input mixer (2 phono, 2 line, 1 mic). Easy glide replaceable crossfader. 2 band music EQ with up to 35dB cut per channel. CM4-BT Compact Mixer with Bluetooth. Compact format mixing console with 2 mic/line inputs (jack/XLR) and a stereo line channel, which can be paired to a smart device via an internal Bluetooth receiver. Gooseneck length300mm. 12V XLR CONSOLE LAMP. Fitted with 3 pin XLR plug. Lamp fitted. Citronic Pro Audio kd-i karoke decoder. Condition is Used. Dispatched with eBay delivery – Shutl 1 day. CITRONIC PRO-2 2-CHANNEL DJ MIXER, BOXED. CITRONIC PRO-2 2-CHANNEL DJ MIXER, NEW & BOXED. IN EXCELLENT CONDITION & WORKING ORDER. Citronic MPCD-1.3 Dual CD/MP3 Player. Synergy T2000 3 Channel DJ Mixing Deck. I have not cleaned them so I hope the photographs give a good indication of the quality. I'm not 100% sure if all functions are working and that is why I put in category "for parts or not working".